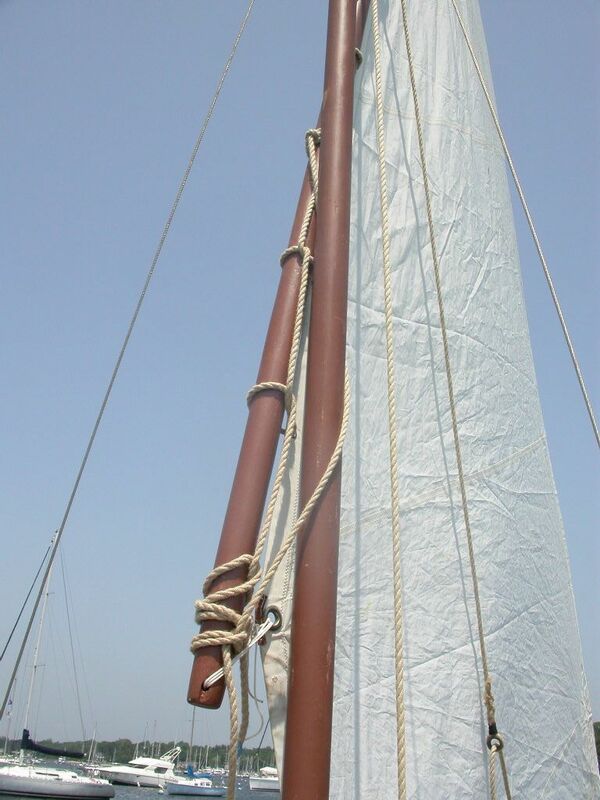 With the mizzen boomkin and mast partner replaced, it was time to work on the rigging. 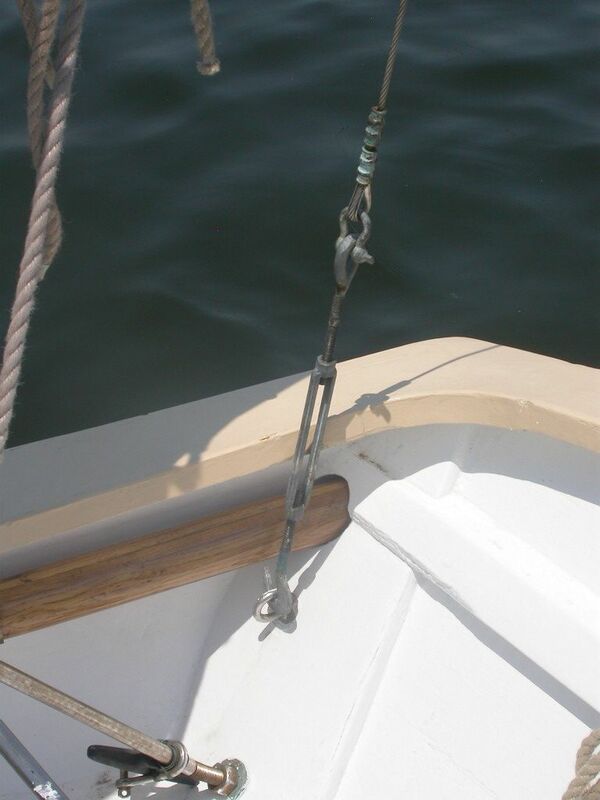 Since I didn't want to attach any weight-bearing hardware to the spars or mast (I did use 2 pad-eyes to prevent lazy jacks from sliding up or down the boom), I had to fabricate all the 'software' from rope. There was quite a bit of trial-and-error fitting required, and a whole lot of whipping, seizing, and other small work to be done (no butane whipping on the Blue Moon! ), so this took time. Anyway, it's finally done, and I had a picture perfect day to go out and take photos of all the various pieces. I'll tackle them one by one. The Blue Moon came with a pair of stainless steel wire shrouds. The bottoms are shackled to heavy eye bolts that go through the transom. Turn buckles allow the shrouds to be tensioned. 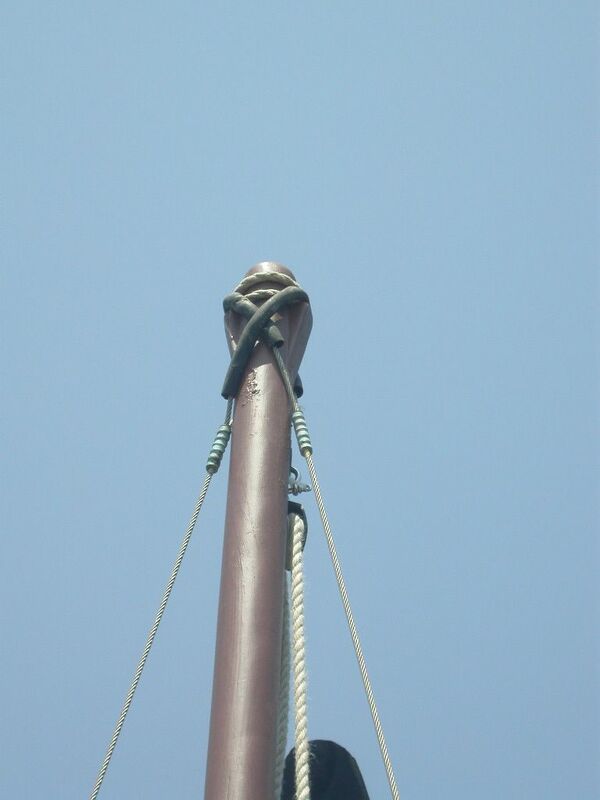 The shrouds are positioned slightly in front of the mast, so provide some support from in front. Obviously, there is no room for a headstay. Shroud shackled to pad-eye bolted through transom. 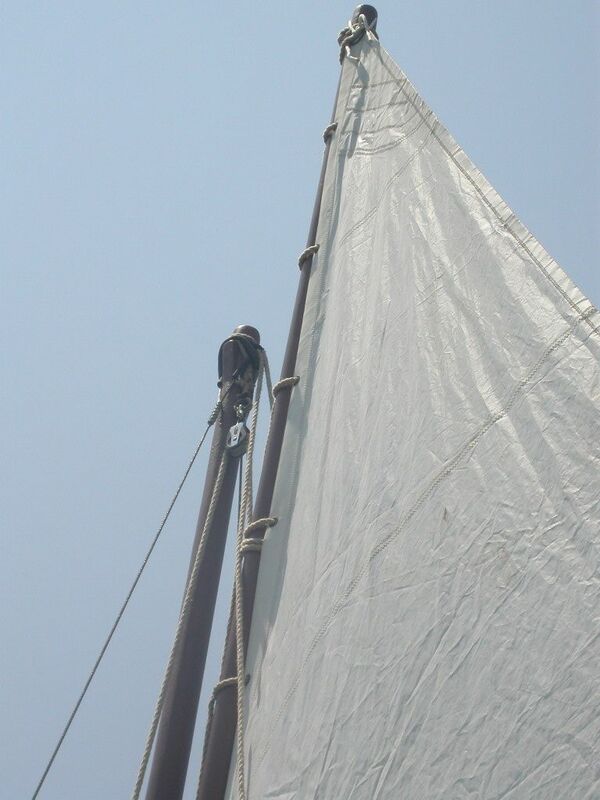 When the mizzen sail is up, the top of the mast is 'stayed' by the virtual backstay consisting of the halyard, sail, sheet, and boomkin stay. One of the big mysteries of the Blue Moon was how the heck you were supposed hoist the mizzen, with no block at the top of the mast. 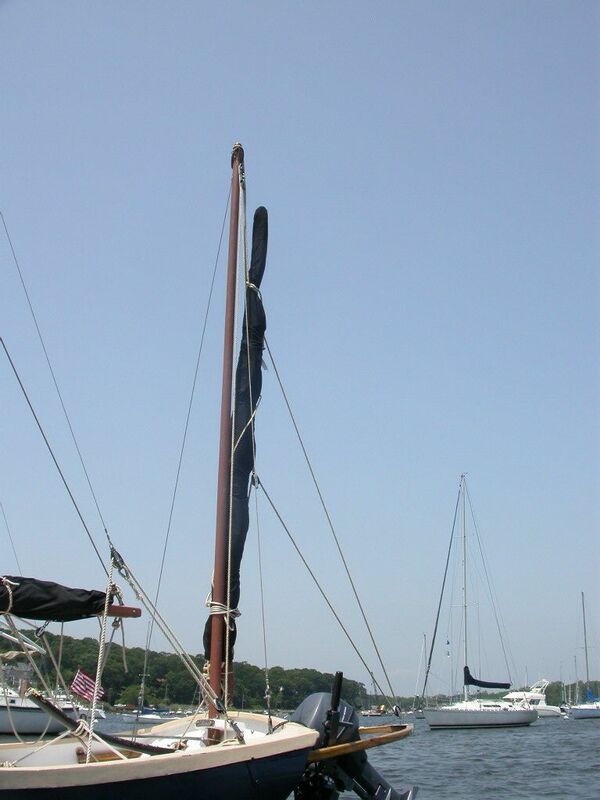 The answer I came up with was to hang the block from a kind of grommet that hooked over the top of the mast, with the soft eyes of the shrouds. However, the lazy jacks (see below) complicated the matter a bit. To make sure the block or halyard didn't get tangled up with them, I needed to make sure the block hung below and between the lazy jack 'legs'. Other than that detail, installation was straight forward. 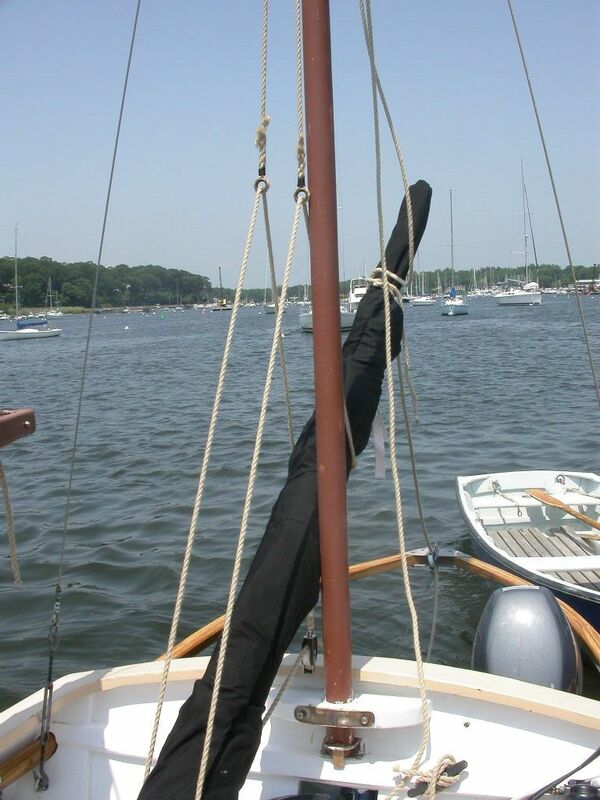 The halyard is tied to the mizzen yard (top spar) with a Studding Sail Bend (Ashley #1678). I had to experiment a bit to find the best place to tie it... A bit more than half-way out seems to be the best. 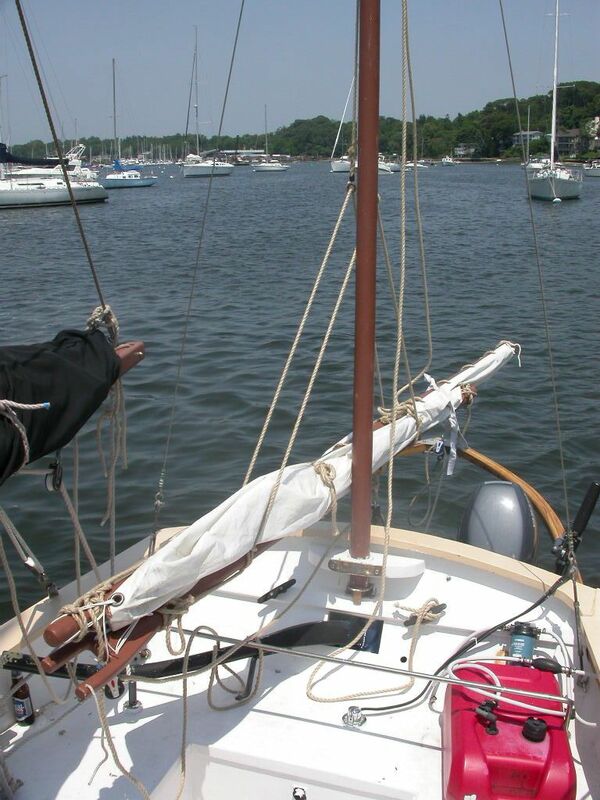 This lets me peak up the sail nice and high, and makes the end of the yard cross the mast. This latter detail is important for the parrel line. 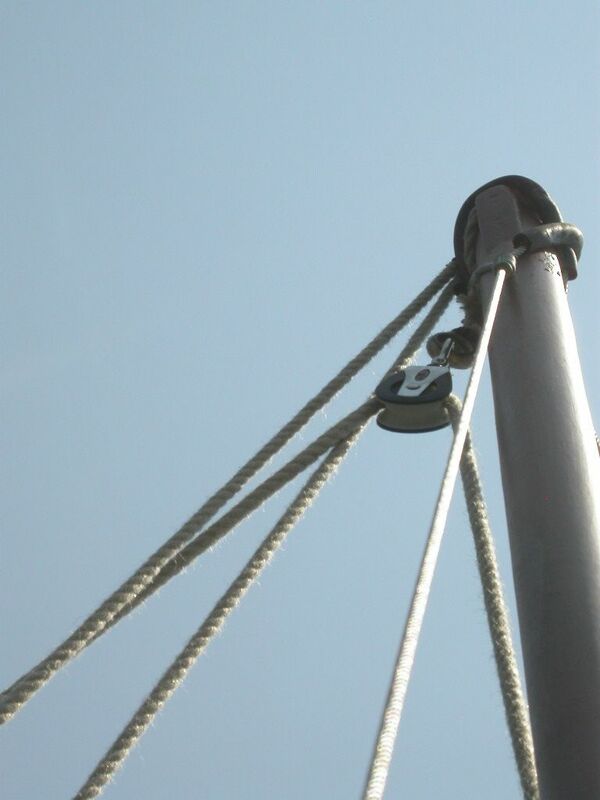 An important component of a lug sail, a parrel line keeps the yard snug against the mast. There are many ways to do this, depending on the configuration of the sail. 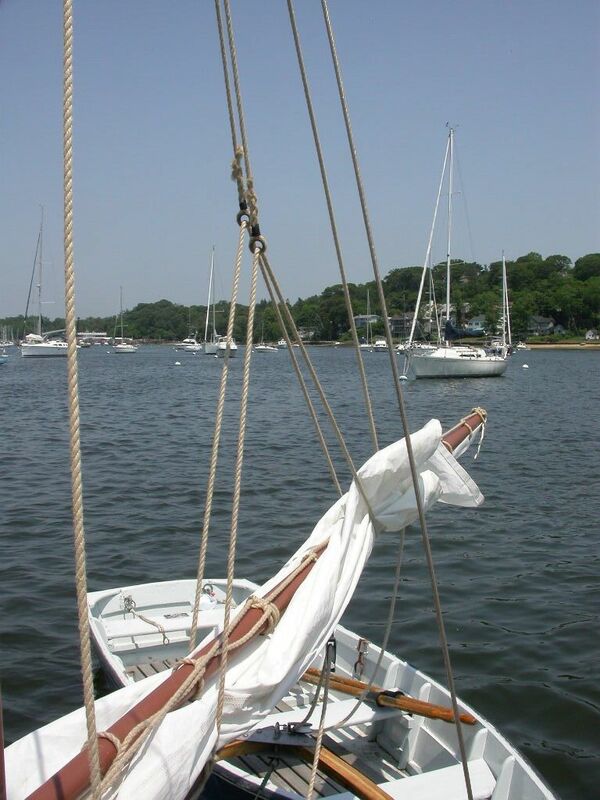 A long parrel line gives the yard a little fore and aft freedom, so that it can find it's on position on the mast. 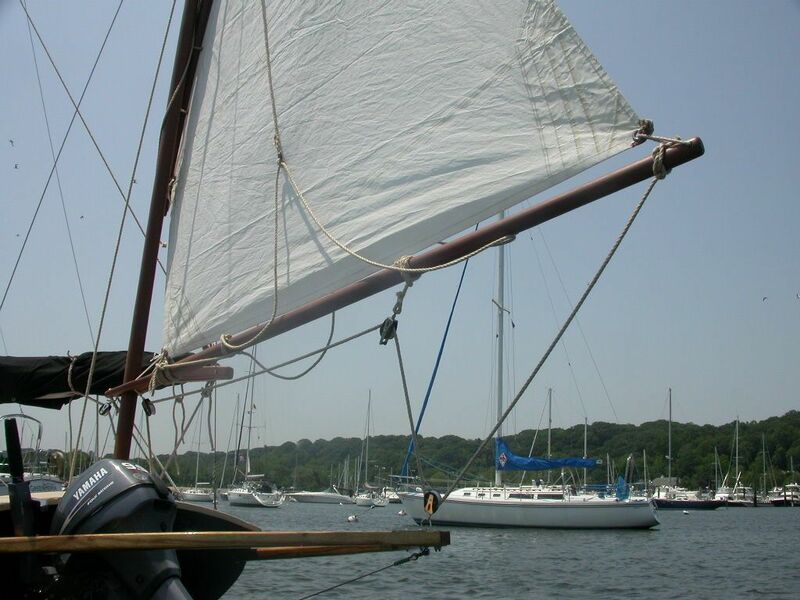 Lazy Jacks were key to building a no-drama mizzen -- one that I could hoist up or haul down quickly and easily, without having a tangle of spars, rope, and sail dragging in my wake. They are fairly simple, just a single line that runs from the boom, up through an 'eye' on one of the legs, down and under the boom, and then back the same way. One end is tied to the boom, the other runs through the in-board pad eye so I can adjust the length of the legs. I'm not sure this 'adjustability' is really necessary, so may trim it off at some point, but at the moment, it's still adjustable. 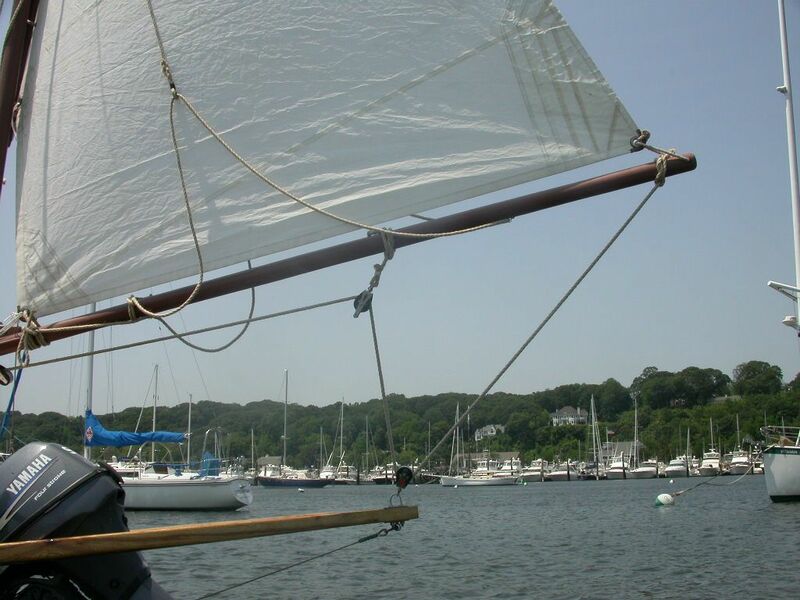 Unexpected bonus: with the sail, spars, etc, lowered into the lazy jacks, I can untie the parrel line closing the gaff jaws, and the parrel line holding the yard to the mast. Then the whole bundle is supported only by the lazy jacks. I can push it back, clearing the jaws from the mast, and then swing the bundle back into the cockpit. 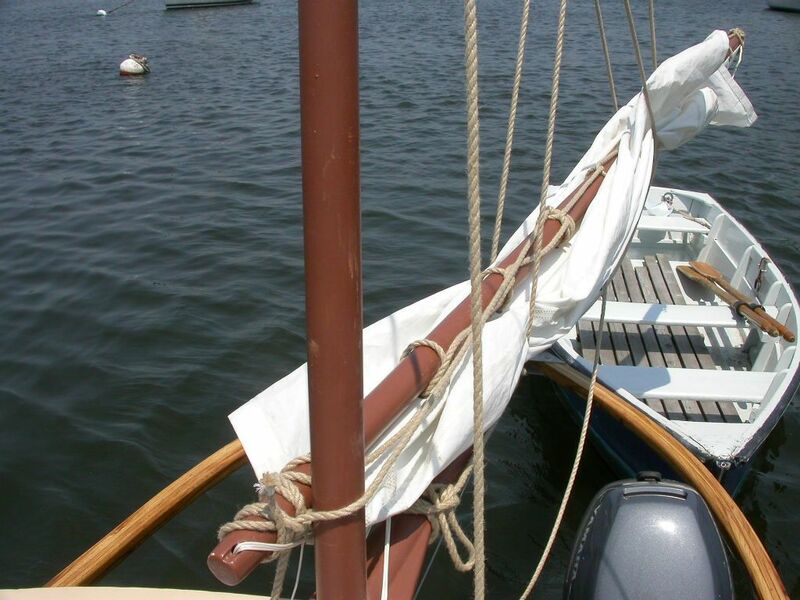 Once I do so, it's easy to throw a few sail ties around the sail and spars, untie the halyard, put on the cover, tie the halyard back on to the end, and hoist the covered mizzen up the mast for storage. All from the comfort of the cockpit. I wondered about where to store the mizzen... I didn't really want it projecting 10' behind the boat on the mooring. Storing it up the mast is the perfect solution. Lots of people hoist the mizzen up the mast, but lazy jacks make it easy to do, without climbing out onto the boomkin. Nothing complicated about the sheet... except for how to attach the 2 blocks to the boom. I experimented with several methods... I didn't want to use any extra hardware, wanted to be able to adjust the position easily, and didn't want them to slide around on the boom, so ended up bending them on with the Studding Sail Bend. This works for now. Once I'm sure where I want them, I may hang them with grommets tightly lashed to the boom. So, we have a whole lot of gear for a very simple sail. But the gear itself is very simple and home-made. The result is all that I hoped for: very strong, easy to set and strike, manageable from the cockpit. I've already sailed with it several times to see how it works. Other than having to tighten the shrouds so they were *really* tight, it all worked beautifully. So I'm calling this big (and long!) project a success. Yay! Next up, the topsail! 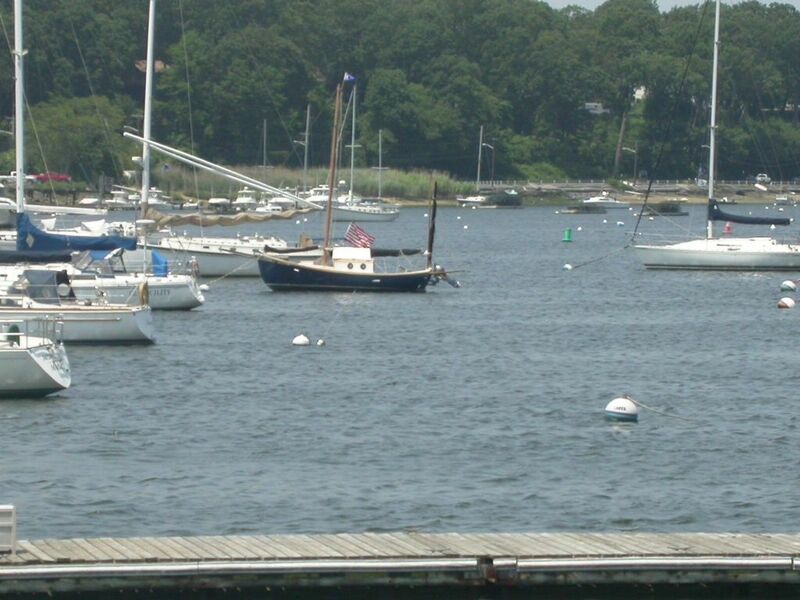 Then I will be officially switching blog-gears from building to sailing, for the summer. The topic will be "No-drama Sailing" and Helena will be co-blogging with me, from the sailing-spouse perspective. Should be lots of fun. Ah! This sounded right to me, but when I googled it, all I found were metal fittings for wire stays. Perhaps these were named after the original wooden hounds, I thought. Anyway, I was motivated enough to search through Chapelle's "Boatbuilding" to see if I could find it. Turns out, there are two correct words for them: "hounds" and "shoulders". BTW, the reference in "Boatbuilding" is on page 561, for anyone who's interested in learning more. Good lookin' rigging, John. Great pics and explanation. Just a question. Must the lazy jacks be of such a large dia line? The lazy jacks are made from 5/16" line. I suppose you could go down to 1/4", or even 5/32" -- either one would probably be strong enough -- but I had the 5/16" on hand. The sheet & halyard are 3/8", not because of strength, but because anything smaller is tough on the hands if you need to haul on it. I'm gradually changing all the lines over to Hempex. It's not perfect, but it's the best traditional-looking, modern rope I've found. Thanks. I know a lot of this stuff is a bit obscure, but hopefully useful to some people.